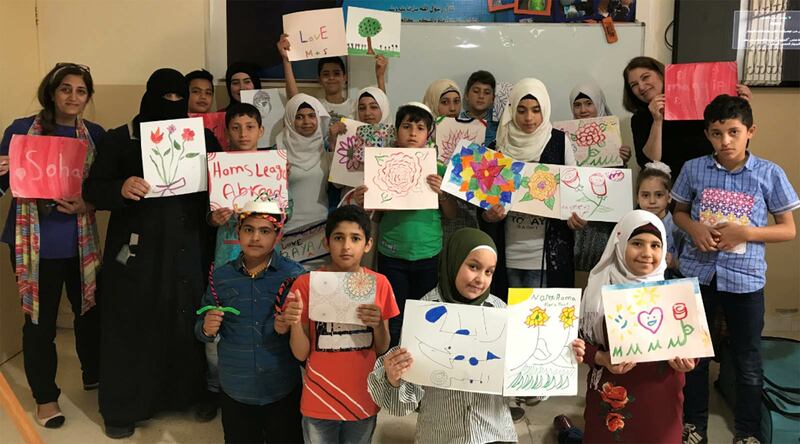 While some members of the Alalusi Foundation team were sharing knowledge on dental hygiene and relaxation techniques for Syrian refugee widows, Maggie Conroy and Suha Abbasi were working with kids and adults to express themselves therapeutically with art. Over the course of time spent in Lebanon and Amman, they affected the lives of over 100 children and adults as they brought much needed therapy through art to various centers. 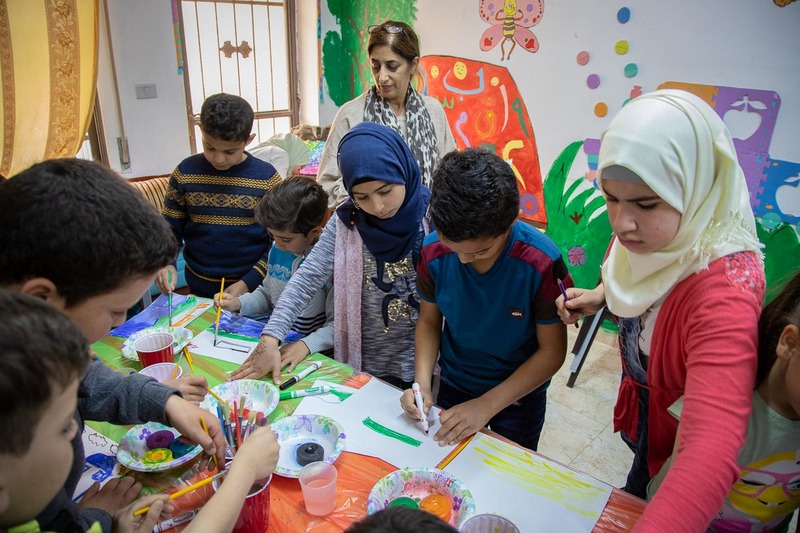 Homs League Abroad - At the Amman home, equipped with ample paints, pipe cleaners, beads, collage materials, markers, gel pens and chalk, Maggie and Suha assisted the kids, some of whom were orphaned by the war, to tap into their deep creativity to make jewelry, hats, bowls and drawings. 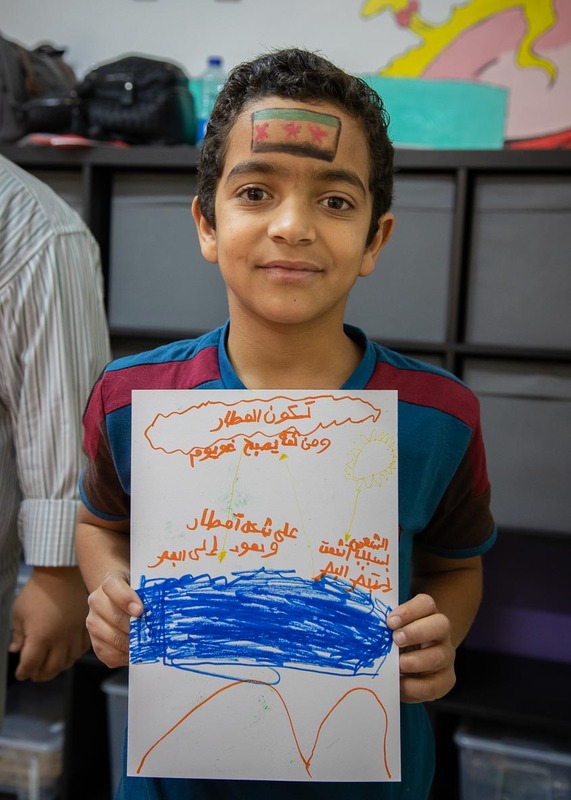 From the moment when the supplies brought over from the US were laid out for the participants, the children excitedly chose their desired media and, some frantically and others with great precision, went to the playful work of creating art. I met Suaad, a 14-year old girl, who has lost all her family and is living on her own at the center. She is very interested in art and wanted to share her drawings with us to put into our art shows. I was able to work with her individually for a time. Later, I gave her some colored pencils, a sharpener, and some paper so she can continue to use art as a way to express herself. 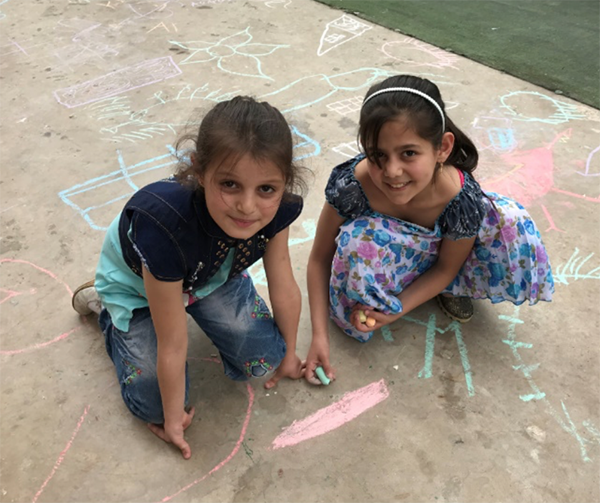 At the HLA homes in Tripoli Lebanon, kids were given sidewalk chalk and unleashed on the cement play yard to draw, eliciting much excitement, smiles and gratitude to Dr. Mazen, General Director of the HLA chain of Syrian refugee homes, and Dr. Hesham. By the end of the time, there was hardly a spot untouched by their now dusty hands (and clothes). The kids were very excited to get their faces painted by Maggie, choosing from a variety of designs,of which lions, butterflies, and Syrian flags were the favorites. 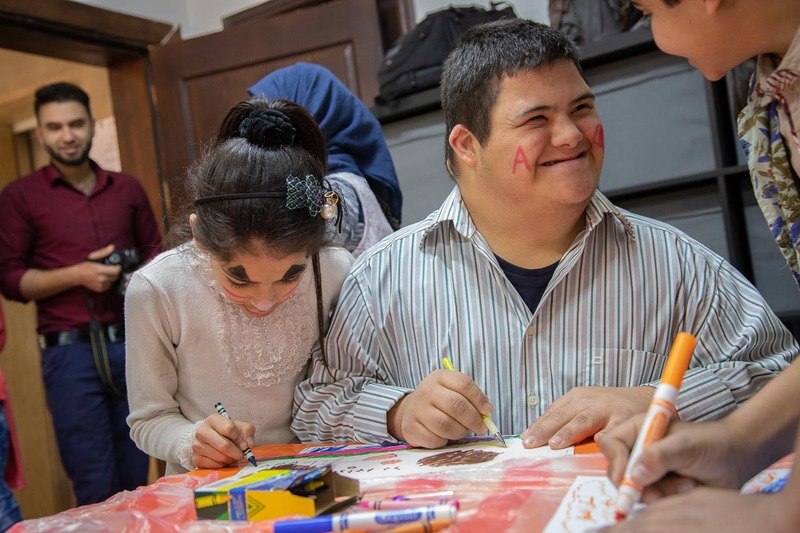 As the process was shown and explained, materials were given to a couple of the older children to pass on the experience, bringing much happiness to Abdullah, a teen boy with Down's Syndrome who got his face painted. A girl named Noor asked how to represent “Silent Spring” and then drew leafless trees and placed the sun in the middle of the page. This led to a discussion with other teen girls, Zohoor, Aisha, and another girl named Noor, and an impromptu “sharing session” and subsequent trip outside the center the next day. On our final evening in Lebanon, we were blessed with a being present for a concert of dance, singing and theater put on the by the children who live in the three centers. In the entry hall to the auditorium, children's drawings from the previous days were hung on the walls so that adults and children, residents and visitors alike could view and enjoy. 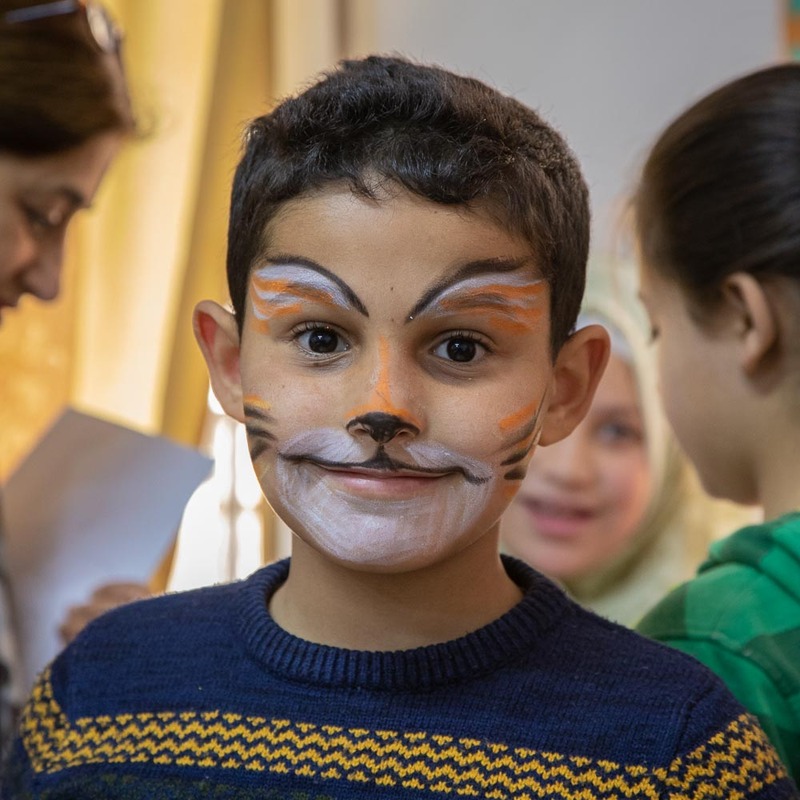 Ensuring that these fun-filled events were not isolated experiences, the Alalusi Foundation, through your donations, purchased additional art supplies for each of the centers. 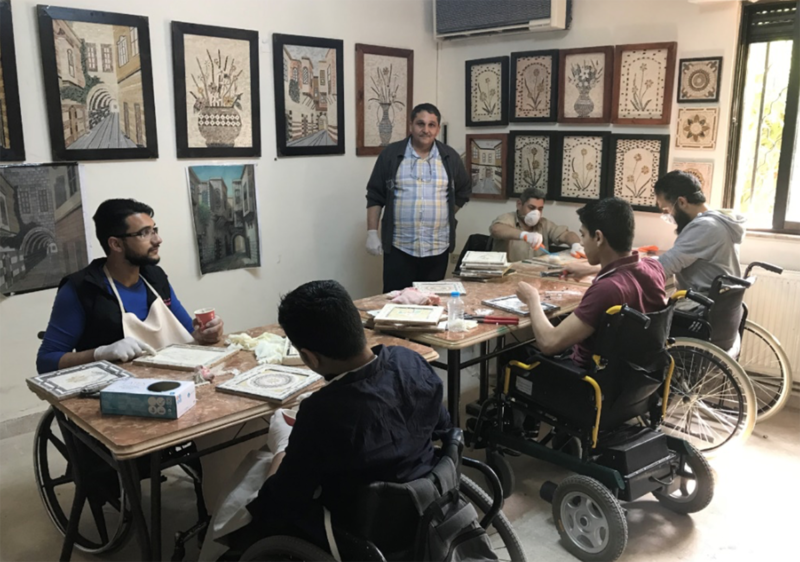 Souriyat Across Borders - A group of wheelchair bound men, disabled by the war in their native Syria, have formed a crafts group which acts as a conduit to therapeutic healing for their physical and psychological wounds. Under the leadership of Obadah, these men aspire to form an art academy where they and others cancome together to learn formally and from each other local arts and craft techniques. Additionally, they would like to use the space as a gallery for exhibition and expansion further into the community and to unite both within their native group as well as with their host country of Jordan. The first medium on their list is to train in mosaic, expanding into other media methodically before launching their academy. Maggie purchased several mosaic art pieces to add to our art initiative shows in the US which raise awareness and funds to continue assisting Alalusi Foundation beneficiaries. 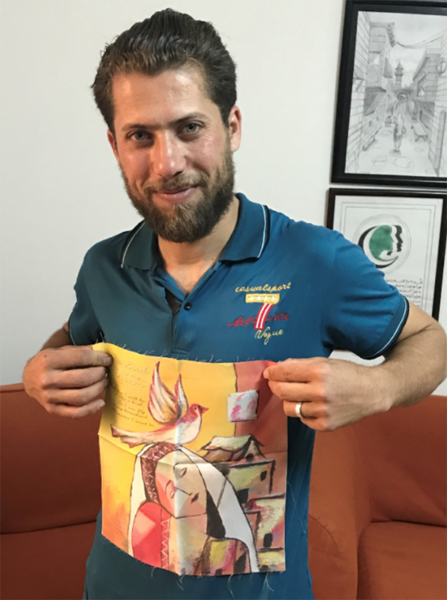 Zaatari Camp Children's Art - Our group met with Mohammad Amari, the founder of a program that has been instrumental in bringing art to the children of Jordan's largest refugee camp, Zaatari. His group inspired the Alalusi Foundation's Art Initiative, yet we had not met in person. Needless to say, we were thrilled to meet and had a very successful discussion on future plans including the committed purchase of paintings each month. 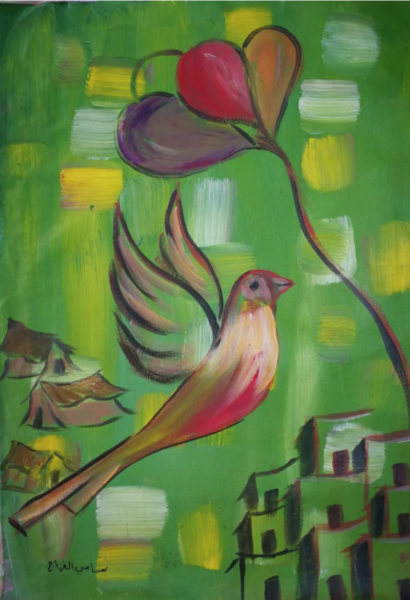 Some of this art created by his students has already been exhibited and sold in various shows, including on the Google campus in Mountain View, California and at Pacific Hearing Service in Menlo Park. After this initial meeting, the Alalusi Foundation is committed to defining further our working relationship, evolving our process and goals from both sides. Hesham Al-Dahabi - Mr. Al-Dahabi works with trauma-affected children in Iraq. Through collaboration with him, we are building a plan to bring these youths' artwork to the US for exhibition, informational purposes, and sale in the near future. The Alalusi Foundation is looking into the feasibility of a trip to Iraq to tour his orphanage or bring a group to a neutral location later in 2018. I miss my mother home. This is one of the paintings being shown May 15th at the Associate in Hearing Art Show in Philadelphia.